Critical temperature ( Tc ), critical pressure ( Pc ), and critical volume ( Vc ) represent three widely used pure component constants. 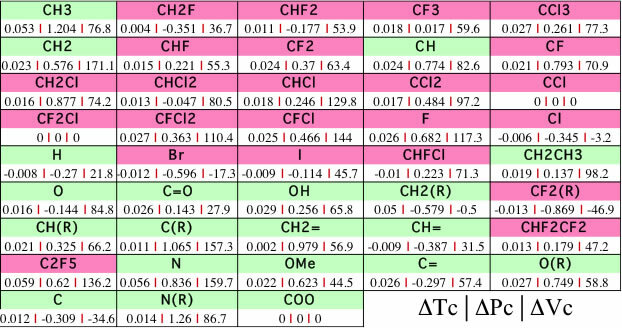 These critical constants are very important properties in chemical engineering field because almost all other thermo chemical properties are predictable from boiling point and critical constants with using corresponding state theory. 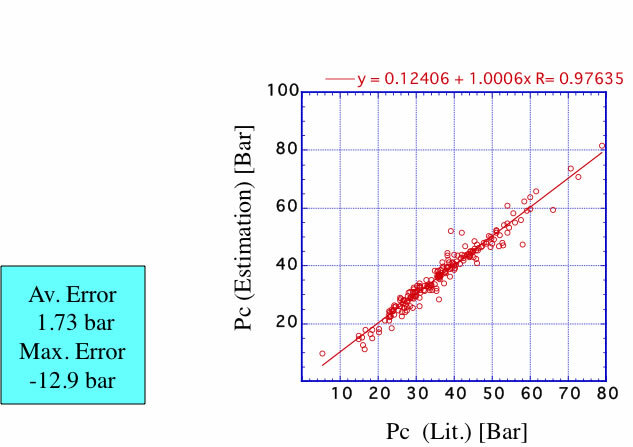 So precise prediction of critical constants are very needed. There are several methods to predict critical constants. Every these methods need normal boiling point to predict critical temperature and the accuracy of Tc estimated value is strongly depend on inputted normal boiling point. So for completely unknown molecule case, it needs to estimate of boiling point, then to calculate Tc, this means multiply two errors. On the contrary, my neural network method predict critical temperature directly from molecular structure and need not boiling point. For critical pressure estimation, summation of group contribution factors with molecular weight (or number of heavy atom) lead to good correlation. But it is said that both Tc and Pc estimation with group contribution method, it can not introduce bi-functional interaction, so multifunctional compounds case, the result error become approximately 5%.My neural network method takes bi-functional interaction and/or hydrogen bonding effect into account, so accuracy of estimation is much higher than conventional method. Experimental Critical volume or Critical density ( molecular weight / critical volume ) data can not be available so much compare to Tc and Pc. Some data book listed not experimental values but estimated values. Actually, this property is not so sensitive to its structure, but uncertainty of experimental/estimated problem is so serious when applying Vc to estimate liquid density. Our neural network method introduce correction factor from absolute molecular volume calculated from optimized structure by Molecular Orbital. 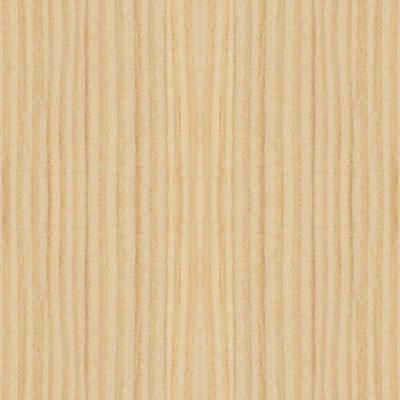 The factor for Pc is middle value of the table. I evaluated this scheme with haloganated compounds. 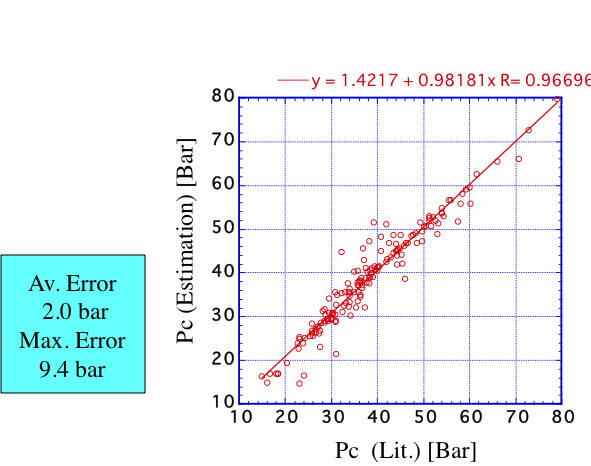 For the crtical temperature estimation, experimental boiling point correction work effectively, but for Pc there is only number of Atoms correction. it is not enough for haloganated molecules. So I build Modified Joback method and define new Functional groups. It is working. The reason I can develope this scheme is that I was working at National Lab. to develope altanative of CFC and had a lot of critical properties for haloganeted compounds. But for other compounds, critical pressure data are so limited. In the popular thermo-chemical Dipper 801 database. Experimental Critical pressure is listed only 324. For the case of Tc, I can use empirical scheme of Tc=1.5*Tb for second type of predicting scheme, but unfortunately no such empirical scheme is known to Pc. So I need build myself. 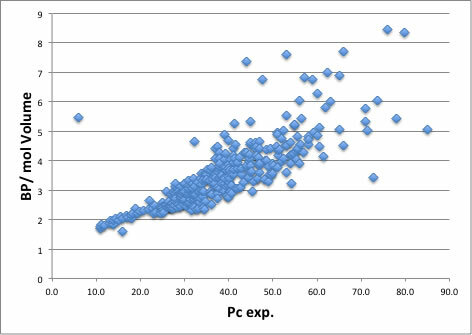 What I found is Pc have correlation with BP/volume. What is Pc? it is just pressure at Tc. Every liquids increase vapor pressure when increase temperature. The boiling point means the vapor pressure become equal to atmospheric pressure. When the boiling point is high, that means molecule interact each other and hard to evaporate. For example, water MW=18 (CO2=44!) even though boiling point is 100℃. The reason is hydrogen bonding. That energy is very large and need a lot of energy to overcome HB. And for nonpolar compounds, boiling point increase if size of molecule become large. So BP/Volume become very good index for interaction per unit volume. And Pc have correlation with this index. With this knowledge, I build new estimation scheme for Pc. The 3rd one is same I explaine at Tc estimation. I use vapor pressure data. 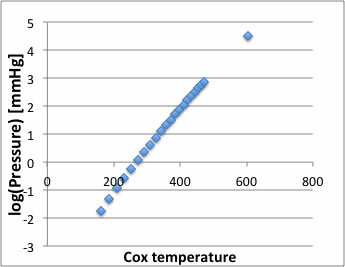 If I plot vapor pressure to Cox temperature, vapor pressure curve become line and critical point come on the line. 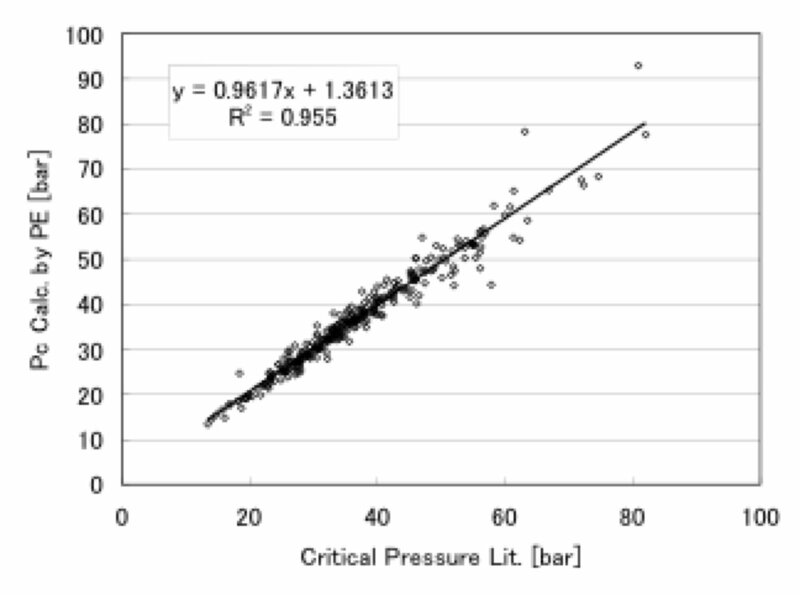 So I can build QSPR scheme to estimate critical pressure from Antoine parameters. The accuracy become figure below. I build 3 type of scheme for predicting Pc and implement final version to YMB-simulator.